"I must have sneezed about 60 times just today!" 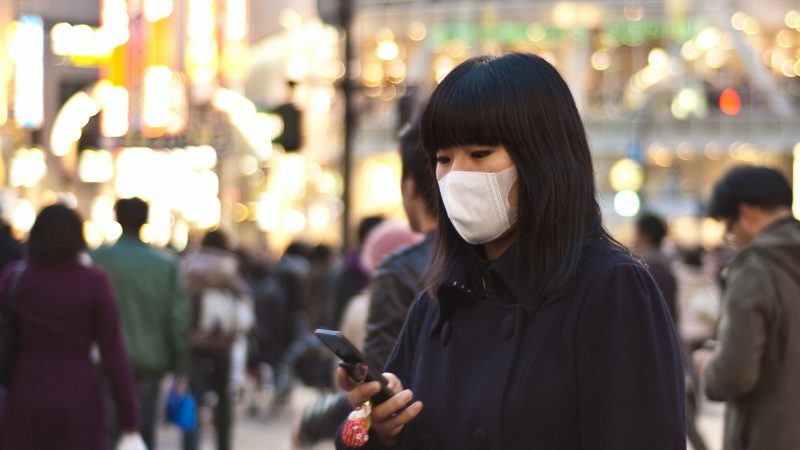 Surgical masks are ubiquitous in Japan, particularly during hay fever season. Image from Flickr user David Shackelford. License: Attribution-NonCommercial 2.0 Generic (CC BY-NC 2.0). Mild weather and beautiful cherry blossoms make spring arguably the best season in Japan. Many visitors to the country carefully time their trips to coincide with the blooming of the cherry trees dotted all across the country. However, some Japanese are less than eager to welcome the warmer weather. Instead, spring in Japan brings with it an invisible menace. Floating in the springtime air is a cloud of pollen grains that induce sneezing, sniffling, and itchy eyes and noses in hay fever sufferers all over the Japanese archipelago. When you think of springtime in Japan, the first thing that comes to mind is iconic clouds of cotton candy pink blossoms, known as sakura (桜) in Japanese. The flowers bloom earliest in Japan's southwest, advancing north- and eastward across the archipelago in what is known as the “cherry blossom front” or sakura zensen (桜前線). Good morning! The early flowering cherry blossoms are in full bloom! But the blossoms aren't the only thing making their way across Japan as the weather starts to warm up. Clouds of pollen also move from north to south, wreaking havoc on hay fever sufferers’ sinuses in the process. It isn't flowers that cause hay fever in Japan. 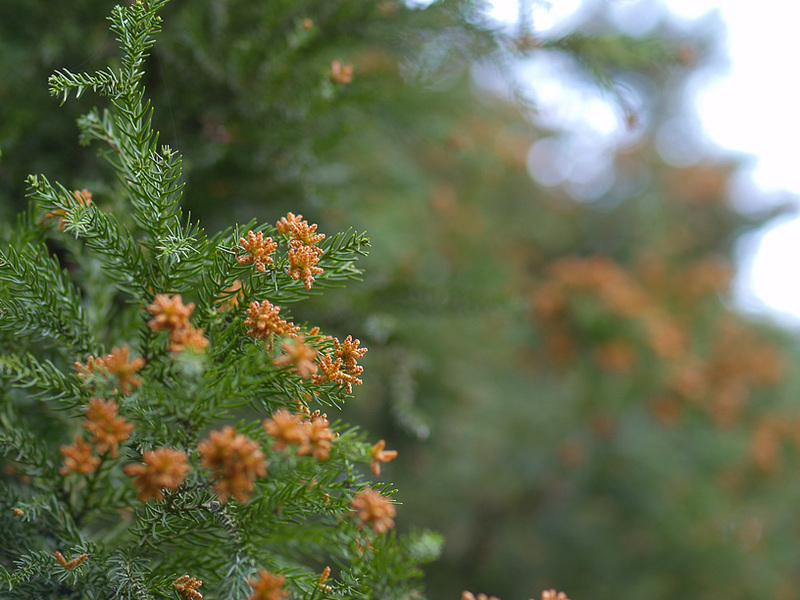 The culprit is pollen from trees, in particular the Japanese cedar or sugi (杉, cryptomeria japonica) and Japanese cypress or hinoki (檜, chamaecyparis obtusa). 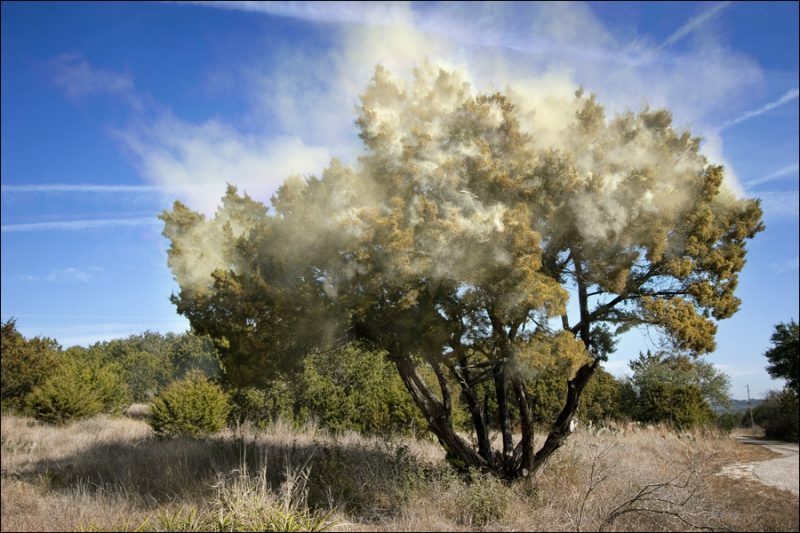 A cedar tree releases clouds of allergy inducing pollen. Image from Flickr user Andy Heatwole. Image license: Attribution-NonCommercial-NoDerivs 2.0 Generic (CC BY-NC-ND 2.0). For western and eastern Japan (including Tokyo), hay fever season starts between late January and mid-February, as the weather begins to warm up. Cedar pollen production peaks in late March to early April and then steadily declines, while cypress pollination lags behind by about a month. Many Japanese netizens are taking to Twitter to document their symptoms. My hay fever's acting up and I feel awful…! 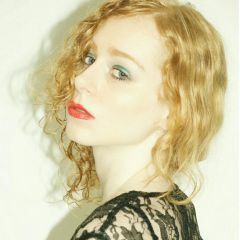 Whenever I'm caught without my tissues my nose runs constantly, but it's all part of my look. I must have sneezed about 60 times just today! Japanese media tracks and reports on the pollen season each year in much the same way it reports on the blooming of the cherry blossoms. The map below shows the progression of the “cedar pollen front” or sugi kafun zensen (スギ花粉前線) across the country. The Japan Times reports an estimated one quarter of Japan’s population of 123 million people suffer from seasonal hay fever. But it hasn't always been this way. In fact, pollen allergies were rare in Japan until the 1960s. The rise of hay fever is closely linked to Japan’s forestation policy after World War II. As the nation rebuilt itself, demand for timber surged, and cedar and cypress were the trees of choice for the forestry industry. 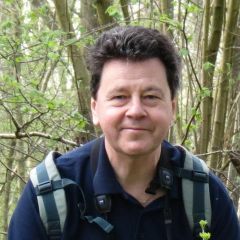 However, a wide availability of cheap, imported timber and the resulting decline of the Japanese forestry industry has meant that a lot of the trees that should have been cut down by now have been left to grow. Many of these trees are at least 50 years old—their peak pollen producing age. Cedar pollen. Image from Flickr user Tam Tam. Image license: Attribution-ShareAlike 2.0 Generic (CC BY-SA 2.0). While one might expect hay fever to be more common in rural areas with a lot of trees, in fact the opposite is true. In cities, pollen particles fall on concrete and asphalt rather than being absorbed by the soil. From there, they are swept up again by winds to recirculate. Japan's urbanization has also eliminated many of the farms and windbreaks that had once helped keep much of the pollen from reaching the city. Another contributing factor to Japan's hay fever problem is air pollution. In addition to exhaust gas emissions, PM2.5 pollution from China is an ongoing problem in Japan. Research shows that hay fever is exacerbated when pollen mixes with other pollutants in the air, another reason why the highest hay fever rates are found in cities, even though they typically have lower pollen counts than rural areas. 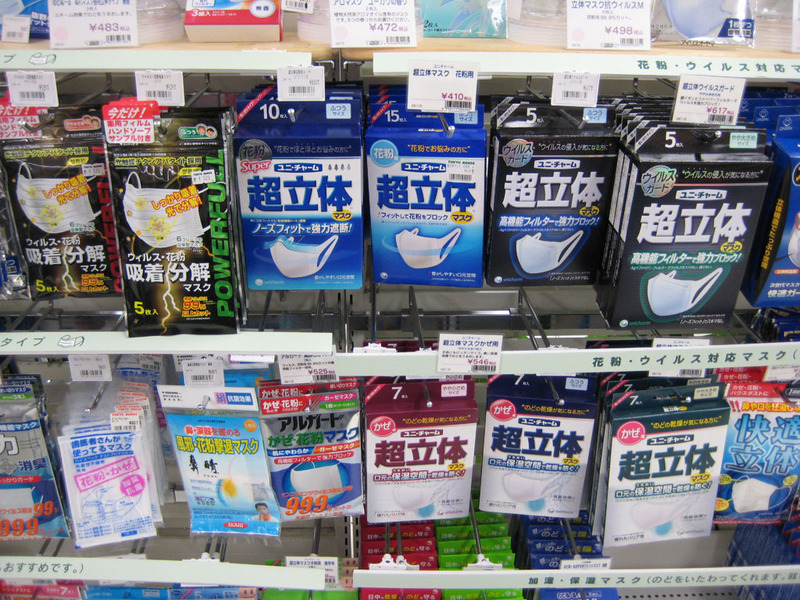 Hay fever sufferers in Japan have no shortage of products to choose from. Photo from Flickr user Andrea Hale. Image license: Attribution-NonCommercial 2.0 Generic (CC BY-NC 2.0). At least hay fever sufferers have a wide array of products, such as masks and goggles, to choose from to aid them in their fight against pollen. Japanese company Unipac has even developed an air-conditioner filter capable of absorbing about 99% percent pollen within an hour. Hyposensitization treatments, where patients are given small doses of pollen extracts via injection or drops into their mouth to help prevent the body from overreacting to pollen, are also increasingly popular. A severe hay fever sufferer's day begins with careful preparation. Take your medicine, apply Vaseline to your nostrils, put on your mask and sunglasses and step outside. Let your guard down for just a moment and it's game over. That first sneeze opens the floodgates. The key to winning the fight is holding back that first sneeze. Each day, the battle rages on. The hay fever season winds up around May, bringing much needed relief to those with pollen allergies. But as the cedar and cypress trees (and their pollen) are unlikely to be going anywhere in the near future, Japan can expect another round of hay fever misery next year. On the bright side, it's a boon for the companies that produce pollen-filtering masks.